Cristen is using Smore newsletters to spread the word online. You should be feeding chicken feed. You also should be topping your feed with high octane and power fuel. You should be mixing fat items bacon grease, coconut oil or buttermilk. It should be a "mushy" consistency. This will require you to check the feed more often because the bird tend to not be attracted to the hard old feed. You may want to top with gro-gel or mealworms to help make them want to eat it. I will be at the project center on Wednesday from 9-10am, if you would like me to help you mix your feed. You should have around 18-15 birds. Please let me know if you need help with culling. If you dispose of your birds at the project center. Please be sure they are not moving when you put them in the blue dumpster and they are in a tied plastic grocery bag. Your bird should be basically using your entire pen. Please keep your shavings clean! 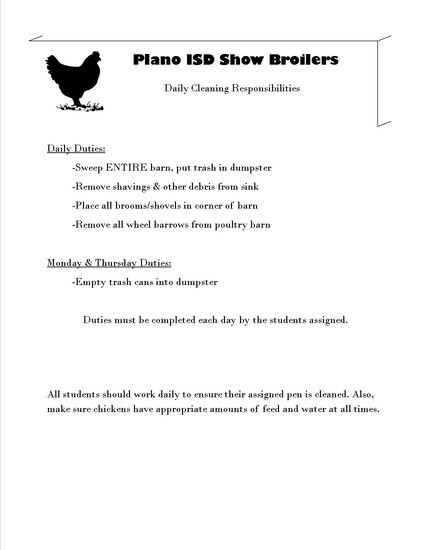 We will be taking our birds to be processed on Sunday January 10th. We should take them around noon and it will take 4-5 hours and you will need to plan on helping. It will cost $1.25 per bird. All birds must be out of the barn by 11:59pm on Sunday January 10th. You can start storing your items in your locker to give more space for your birds. Please do not pour shavings or feed into the sink. Also, make sure that you clean it up on your schedule cleaning day. Please print and review often! Please make sure you are cleaning the barn on your assigned date and completing all duties. It was very very messy yesterday. Should a student fail a class the 2nd six weeks, they can regain eligibility (be able to participate in the Collin County Show) by passing all classes on December 3rd. 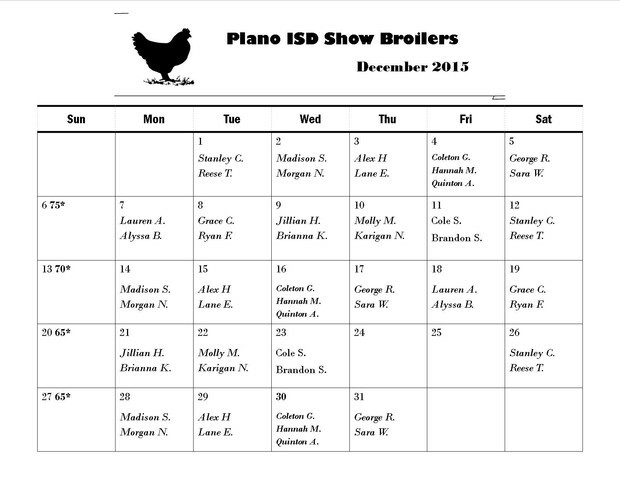 Students that are still not passing will NOT be allowed to participate in the Collin County Show. Students that cannot participate will forfeit all entry fees. I will assign two other Plano West students to help you show your chickens at the county show and let you know those plans at a later date.